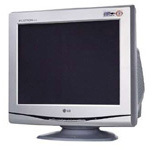 In the past we have reviewed a wide range of monitors, from a wide range of different manufacturers. This has included some high end professional grade screens as well, for example from NEC and their SpectraView range. We have had a lot of reader feedback asking for reviews of Eizo monitors as well. While these are again high end and quite niche models, they offer an impressive range of features and some interesting things for us to test and evaluate. We hope in the future to feature more Eizo reviews, and we wanted to start with their 27" FlexScan SX2762W screen here. The SX2762W is an alternative to models such as the NEC PA271W, NEC SpectraView Reference 271 (a.k.a. NEC PA271W-SV) and the more mainstream Dell U2711. Like those other models the Eizo offers a wide colour gamut, and features the more traditional CCFL backlighting technology as opposed to the currently popular W-LED backlighting. It offers a whole host of interesting and high end features including support for hardware level calibration, a 16-bit Look Up Table (LUT), '10-bit' panel, uniformity correction technologies and several features aimed at power saving and more comfortable user experiences. We will test these throughout the course of the review. Eizo's website states: "Featuring an impressive 27-inch screen, wide colour gamut, and hardware calibration capability with the optional EIZO EasyPIX colour matching tool, the FlexScan SX2762W makes it easy for professionals in graphic design, digital photography, CAD/CAM, and DTP to get predictable colour results." The SX2762W offers a decent enough set of interface connections. It has a Dual-link DVI connection which allows you to run the screen at its full 2560 x 1440 resolution providing you have a compatible graphics card. The dual-link DVI cable is provided as well in the box. There are also two DisplayPort connections here, one is a normal size and the other is a Mini DisplayPort which is very useful for connecting Apple Mac machines. The two DisplayPort connections are listed by Eizo as supporting HDCP for encrypted content, but oddly they do not mention support over DVI. According to the NVIDIA control panel on our test machine, the DVI connection is HDCP certified as well. Eizo have opted not to provide connections for D-sub (VGA) or HDMI here which are perhaps a little missed. Those connections cannot support the full 2560 x 1440 resolution due to bandwidth restrictions, and so presumably one of the reasons they have been omitted, along with the fact this screen is not really aimed at multimedia users. It would have been nice to see them included though I think in case you needed to connect an external device, even if you then let the screen interpolate and scale the image, or just used the built in aspect ratio control to put borders around the image. There are 2x USB ports provided on the underside of the back of the screen which are useful for connection of external devices. It might have been good to have a couple available on the side of the screen as well for easy connection of devices, such as the calibration equipment you will probably want to use with a screen like this. There are no speakers or audio connections on the screen. It does however offer some high end features which we have already mentioned. 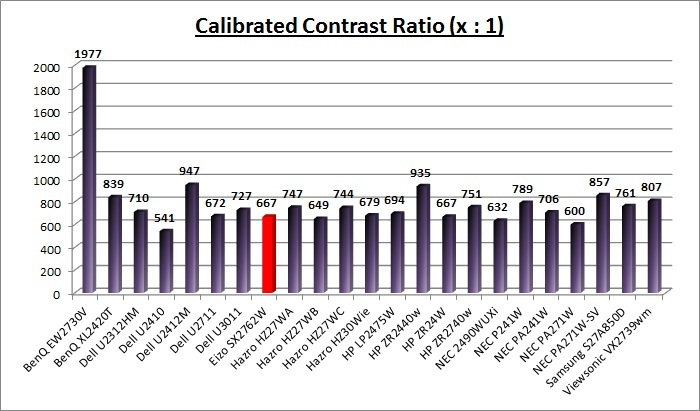 There is a 16-bit hardware programmable LUT for calibration, a digital uniformity correction technology like NEC's ColorComp which is called Digital Uniformity Equalizer (DUE), an ambient light sensor (Auto EcoView) and a human sensor (EcoView Sense). 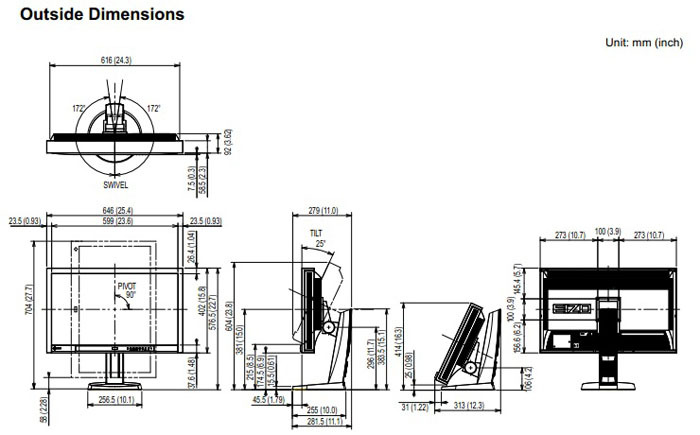 The Eizo SX2762W comes in an all black design. The plastics are almost entirely a matte finish, apart from a strip along the bottom bezel which is a glossy finish. The section contains the EcoView sensors and the OSD operational buttons. In the top right hand corner of the screen there is a removable 'FlexScan SX2762W' sticker in a silver finish. The bezel around the panel is fairly thick and it measures 22mm along the sides, 26mm at the top and 35mm along the bottom. The panel itself is also inset quite a lot, with the bezel protruding outwards towards the user by ~8mm along the top and sides, and by up to 16mm along the bottom edge of the panel. The sides of the screen is squared off along the edges apart from at the bottom where the bezel curves away along the lower edge. Because of this thick chunky bezel the screen does look quite blocky and 'industrial' from head on. There is an Eizo logo on the bottom left hand corner of the bezel. From the above photo you can see where the bezel curves away along the lower edge. The back of the screen is pretty flat and squared off. There is a large Eizo logo etched into the plastic back as well. There are various grills along the edges of the screen to allow for heat dissipation. There is also a grill in the middle of the back of the screen, just above the stand. If you look closely (not on this picture) you can see there is actually a small fan visible behind this section to help with keeping the screen cool. We will explore this a bit more shortly. The stand connects through 4 screws on the back of the screen which is also VESA 100mm compatible if you want. If you do decide to mount this screen in any way you will need a very sturdy mount / arm since the screen is very heavy (9.7Kg without the stand). The bottom right hand portion of the lower bezel features the OSD operational buttons which we will talk about shortly. You will spot on the left hand side the 'Auto EcoView' sensor which detects ambient lighting conditions and adjusts the brightness of the display accordingly. At the right hand end is a small rectangular power LED which glows blue during normal operation. You can control the intensity of this LED in the OSD menu as well if you want. In standby this glows orange. The base of the stand is a chunky but balanced round plastic bottom with a thick and heavy duty arm connecting up to the back of the screen. Overall it gives it a level and sturdy support which is good. On the back of the monitor arm is a small click-shutting door as shown above which allows you to tuck the cables nicely out of the way. There is a wide range of ergonomic adjustments available from the stand. Above shows the maximum and minimum height of the screen within its specified 151.mm adjustment range. In fact we measured the bottom of the screen as being 180mm above the height of the desk at maximum height, and only 20mm when at its minimum. So it appears the adjustment range is slightly more at 160mm in total. At the lowest setting the screen is very low to the level of the desk as you can see but this does afford the user a very good range of movement which is nice to see. The movement itself is smooth but quite stiff, mainly because it needs to be to hold the weight of the screen. It's easy enough to re-position though. There is a decent tilt range available from the screen as well, both forward and backward. The range is shown above, and its fairly easy to re-position the screen. As you do so, the movement is smooth and sturdy. As you can see from these side views the profile of the screen is also very thick at 281.5mm (with the stand) according to the spec. The SX2762W uses CCFL backlighting, has an integrated power supply and also features a whole host of internal electronics which all add to the thickness of the screen. There is also a very wide side to side pivot / swivel adjustment range available. There is actually a thin black section on the bottom of the stand shown above which makes contact with the desk, and then rotates within the main body of the base to produce a very easy to use side to side swivel. It is smooth on the most part and offers almost a full 360° rotation. In fact it can swivel 172° either side - you just need to make sure the rotating "disc" is in a central point to start with as you sit it on your desk. The SX2762W also offers a rotation function to switch between landscape and portrait views. While this is smooth and fairly easy to re-position, its value and practical use on such a big screen is probably questionable. Still it's there if you need it and like the functionality. 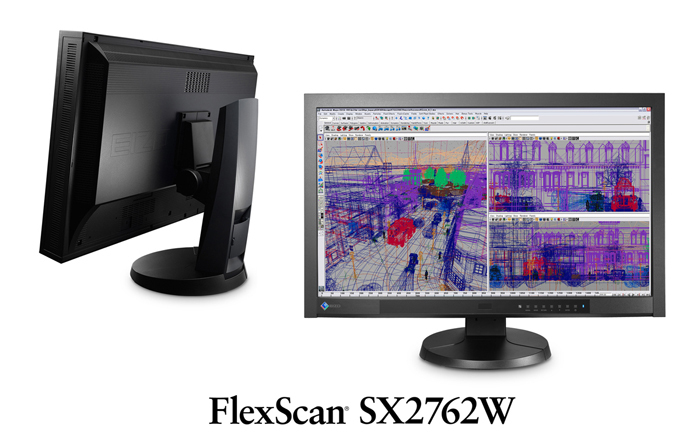 The FlexScan SX2762W features a new cabinet and is the first monitor with the new FlexStand 2. The cabinet design maintains the distinct look of EIZO monitors while introducing a more smoothly rounded appearance. The FlexStand 2 complements the new cabinet design while offering very versatile positioning with 152 mm height adjustment, 25° tilt, 344° swivel, and 90° rotation for portrait mode viewing. Excellent range of adjustments and all pretty smooth. Some are a little heavy to adjust due to size and weight of screen. The underside of the back of the screen features the various interface connections available. The top image shows the DL-DVI connection, DisplayPort, mini DisplayPort, upstream USB and 2x downstream USB ports. The bottom image shows the power connection along with an on/off switch. The screen features an integrated power supply so you only need a normal kettle lead cable (provided) to power the screen. As we mentioned a bit earlier there are quite a few grills on the back and sides of the screen to help with heat dissipation and we could even see a small fan behind the central grill. We popped the back off the screen after removing a few screws to get a closer look. At first (top left image) you will see there is a metal enclosure over the components for protection. Removing that metal plate (top right) exposes the internal electronics and circuit boards. You can see there are actually two small fans connected to the screen which are there to try and keep it cool. In fact they do a pretty good job and the screen is only moderately warm to the touch at the top and sides after prolonged use. However, with the presence of these fans, there is of course some associated noise. Not a problem in an office I'm sure, but home users who are in to their ultra-quiet set ups need to consider this. They were pretty quiet though and I couldn't really pick them out over my graphics card and power supply fans from our test PC unless I moved my head very close to the screen. The bottom right hand picture also confirms the panel part being used here is the LG.Display LM270WQ2-SLA1. This was just visible beneath another metal section which we did not remove as it was unnecessary. The materials used are of a good standard and build quality feels very good, if a little bulky and heavy. It feels a bit industrial but should be very robust for long term use. The screen coating is a traditional anti-glare (AG) solution. Like other modern IPS panels the coating is pretty aggressive and so does give a grainy feel to light / white images. If this is something that bothers you, you may want to look for a glossy solution of one with a lighter AG coating such as some AMVA and PLS based screens. The SX2762W is controlled by a set of 7 buttons which are located in the right hand portion of the lower bezel and are labelled with a subtle grey font as shown. There is quick launch access to control the input selection (signal button) which switches quickly and easily between DVI, DisplayPort and Mini DisplayPort. A graphic on the screen helps confirm which you have selected. The 'mode' button gives you quick access to the 8 preset modes on the screen which pops up a small menu in the bottom left hand corner as shown above. 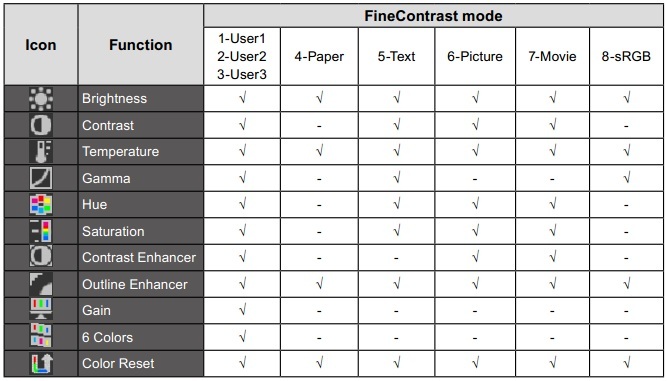 There are 3 user defined preset modes available as well as Eizo configured options for paper, text, picture, movie and sRGB. The up and down arrow buttons give you quick access to the brightness control which pops up in a small box as shown above. This can be easily changed in 1% steps between 0 and 100%. The 'enter' button brings up the main OSD menu and on the far right is the power button. The 'return' button doesn't offer any quick launch access but instead pops up a small guide at the bottom of the screen telling you which each button would do. In fact this guide stays in place while you use the main OSD, telling you what each button would do depending on where you are in the menu and how far you have drilled in. This makes it pretty easy to use and offers a decent level of assistance as you navigate. The main OSD is split into 5 sections which are labelled with different icons running vertically along the left hand side of the photos above. The first section is the 'color' menu which gives you the usual access to brightness and contrast. 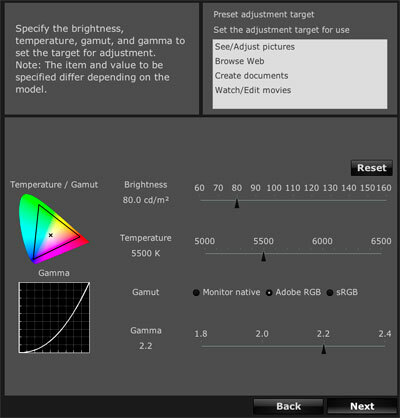 There are also options for colour temperature and gamma which are useful. Drilling into the 'advanced settings' section brings up the menu on the right above, giving you further control over the image including hue and saturation controls. The second section of the OSD is the 'Screen' menu. This gives you control of a couple of useful features including the hardware level aspect ratio control and the overdrive function. We will look at these a little later on in the review. The third section is the 'PowerManager' menu giving you control over a couple of the advanced power saving features provided with this screen. You can turn on and off the EcoView Sense (human sensor) and Auto EcoView (ambient light sensor) here. The EcoView Index sub-section gives you a bit of detail about your supposed power and CO2 reduction depending on your settings. The fourth section gives you control over a few of the menu settings as shown, and the last 'tools' menu allows you to control the input selection along with giving you a bit of access to some monitor information. The 'mode preset' sub-section gives you access to the 8 preset modes as well. You are able to switch automatically between these presets using the Eizo ScreenManager Pro software as well if you need to. Overall the menu is pretty intuitive to use and offers a decent range of options and settings to play with. There is also an "optional settings" hidden menu available which can be accessed by holding the 'mode' button while powering on the screen and holing the power button for at least 2 seconds. You can disable the Eizo boot-up logo here if you want. It doesn't tell you anything about the panel or firmware in this menu though as some hidden screen menus do. In terms of power consumption the manufacturers spec states a typical usage of 64W and a maximum usage of <160W during operation. In standby the screen apparently uses <1W. We tested this ourselves and found that out of the box the screen used 140.1W of power while at its default brightness setting which was at its maximum. Any additional power draw would come from the connection of additional USB devices. At the lowest brightness setting, power consumption was reduced to 59.9W. After calibration at a hardware level, where the process had adjusted the brightness setting to 26%, the screen used 83.6W of power. In standby the screen used 1.3W of power. Overall the power consumption of this screen was high here due to the use of CCFL backlighting mainly. 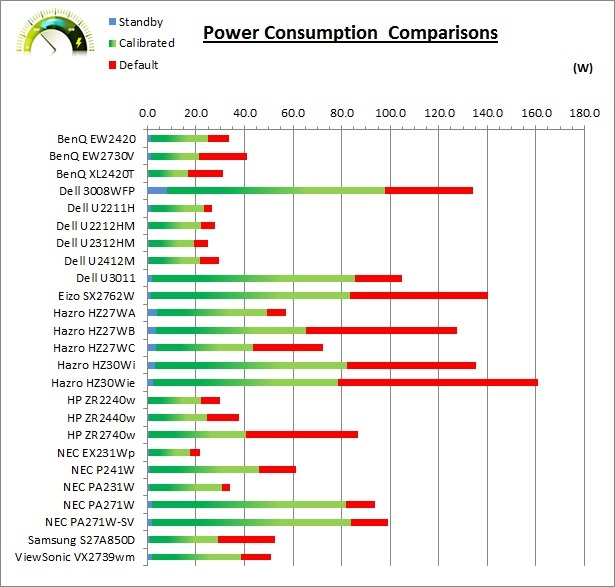 This was quite similar power consumption once calibrated to other CCFL units we have tested including the Hazro HZ30Wie recently, and NEC's rival the PA271W / PA271W-SV. The SX2762W has a few extra features we wanted to talk about here. Firstly there are the two 'EcoView' technologies provided with this screen. Eizo's EcoView Sense feature unites convenience with energy savings by ensuring that the monitor automatically conserves power when it is not in use. EcoView Sense is an integrated presence sensor that prompts the monitor to switch to power save mode when it does not detect your presence for 70 seconds, and then resume normal operation when you return. To prevent the screen from reactivating when it shouldn't, EcoView Sense differentiates between your presence and a still object like an empty chair or general office activity in the background. A sensor on the front of the monitor measures ambient light and optimizes the screen's brightness to ensure the screen is never too bright or too dark. If preferred, Auto EcoView can be deactivated in the OSD menu. A user-activated EcoView Index displays the level of power savings and equivalent amount of CO2 reduction compared to using the monitor without Auto EcoView activated and with the screen set at a brightness of 100%. 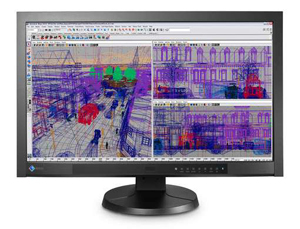 The Eizo SX2762W uses an LG.Display LM270WQ2-SLA1 H-IPS panel which is capable of producing a colour palette of 1.07 billion colours. The screen is advertised as being able to offer 10-bit colour depth as a result. Referencing the detailed panel specification sheet confirms this is in fact using an 8-bit panel with an added Frame Rate Control (FRC) stage applied which is in keeping with many other competing models. In fact the NEC PA271W and Dell U2711 we mentioned earlier are also "10-bit", but use the same LM270WQ2 panel and so also strictly offer 8-bit + AFRC. It's all very well saying a panel is capable of 10-bit colour depth as opposed to an 8-bit colour depth, but you need to take into account whether this is practically useable to you, and whether you're ever going to truly use that colour depth. You need to have a complete 10-bit end to end workflow in order to make use of this which includes a 10-bit supporting application, operating system, graphics card and software. This is still quite rare and reserved really for high end equipment and professional uses. Nevertheless the 10-bit colour support is there for future uses and for if you do have the necessary workflow to support it. The use of FRC at the panel side to simulate this 10-bit colour depth is very common and while it's not a 'true' 10-bit panel, many users (even if they could get a 10-bit end to end workflow) would not notice a difference in real terms. The SX2762W also offers a 16-bit internal programmable Look Up Table (LUT) which means it can offer a 278 trillion colour palette as well, for optimised grey scale and colour rendering. It also uses wide colour gamut (WCG-CCFL) backlighting using 8x CCFL tubes, and so the colour space of this screen covers 100% of the sRGB reference and in fact extends considerably beyond this. The detailed panel specification confirms it can cover 102% of the NTSC colour space reference and 97.1% of the Adobe RGB space. The SX2762W showed a cycling frequency of ~162Hz (27 lines at 1/6 second shutter speed) in the initial tests shown here. A further test at an even slower shutter speed allowed us to more accurately record the cycling frequency at approximately 180Hz (45 lines at 1/4s shutter). At 100% brightness there should be no flicker evident as the backlight is not cycled on and off using PWM. At lower settings PWM is used and the duty cycle becomes progressively shorter. Given the relatively low frequency of the PWM cycling compared with some other displays (e.g. PWM of 300Hz+), there is a chance that flicker may be evident to some users as you lower the brightness setting as a result. The out of the box performance of the SX2762W was quite varied really. The screen was very bright out of the box however which you could immediately spot as it is set at its maximum 100% brightness initially. Colours felt vivid and bright and you could tell that this was a wide gamut screen to the naked eye. We tested the screen using the X-rite i1 Spectrophotometer at default settings first to establish what it measured in the default set up. You may note that by default the screen is set in the 6500k colour temperature mode, and the 2.2 gamma mode. These are the targets we aim for in our tests and so this allows us to establish how accurate those screen preset temperature and gamma modes are in practice. We disabled the EcoView technologies in this part of the review as we did not want the screen automatically adjusting the backlight during the tests. You may also note that for some reason by default the RGB levels were set at 100% red and 90% green / blue which is related to the 6500k preset. If you switch to the 'native' colour temperature mode these default to 100% each. We have also provided a comparison of the colour space of the screen against the Adobe RGB reference to which it is reasonably close. It does not quite cover some green shades but does extend past Adobe RGB in some red shades in this 2D view of the gamut. It should be noted that this screen does not offer any kind of preset Adobe RGB emulation mode and so you cannot more closely match the Adobe RGB reference than this. There is an sRGB emulation mode though which is useful. The gamma of the screen was reasonably well set up with an average gamma of 2.3 being recorded, with a deviance of only 4% from the target of 2.2. The gamma curve was more accurate in lighter grey shades as you can see from the above table, and strayed a little further from the target in darker shades up to 2.28. In fact the average gamma was 2.27 here, being rounded up to 2.3 in the LaCie report. White point was recorded at 5744k being 12% out from the target of 6500k unfortunately. It seems the default 6500k mode is not quite correct. As we had identified with the naked eye the screen was too bright and was recorded at a high luminance of 244 cd/m2 which was only just shy of the specified maximum brightness of 270 cd/m2. 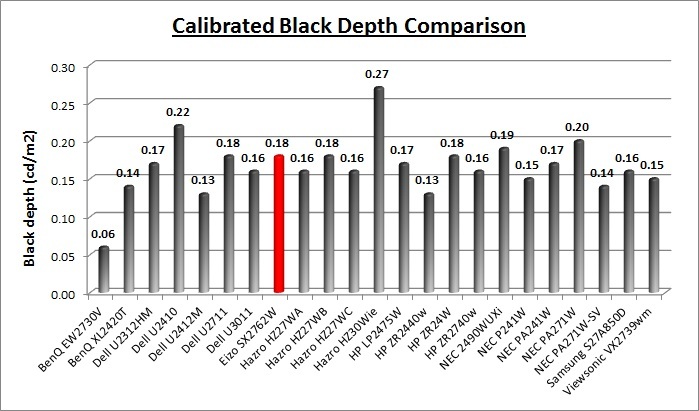 Black depth was measured at 0.35 cd/m2, giving us a static contrast ratio of 703:1. This was moderate for an IPS panel, but not as high as some other IPS based models we have tested which have reached up to around 1000:1. 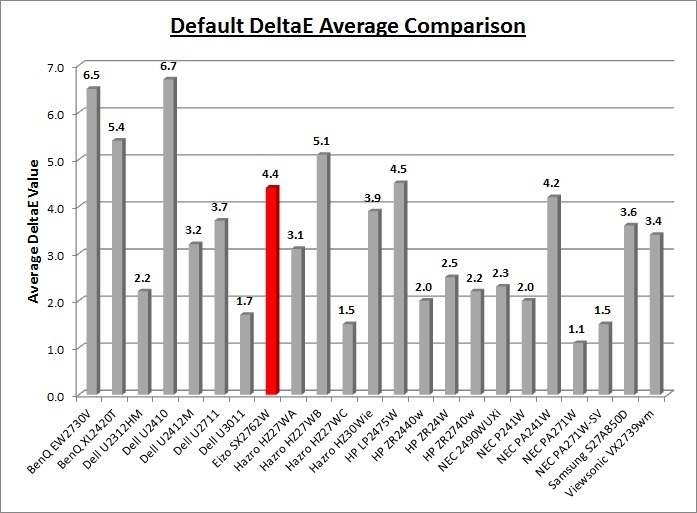 Default colour accuracy was mediocre with an average dE of 4.4 but a maximum of 12.4. You will certainly need to turn down the brightness of this monitor, and some kind of profiling would be beneficial to correct the slight gamma variations and the colour accuracy. Of course with a screen of this type you will almost certainly want to be using a calibration device to really take advantage of the capabilities of the display anyway. The screen offers a very useful sRGB preset mode which is designed to emulate the smaller sRGB colour space. 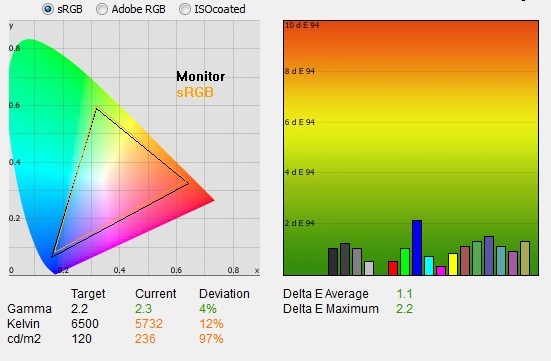 This can be very useful for those working with standard gamut / sRGB content who do not want to contend with the oversaturation and colour management issues associated with a wide gamut screen. 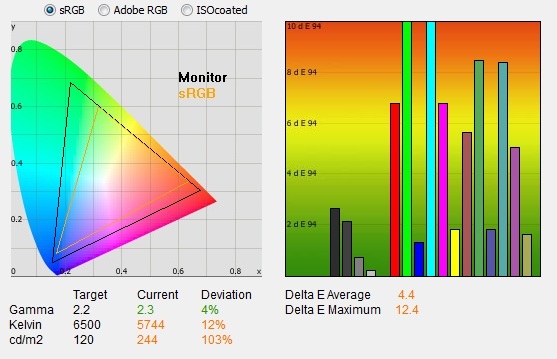 If you are working simply with "normal" sRGB content then viewing that on a wide gamut screen, it can lead to oversaturation of colours, and certain shades can look unrealistic or too neon. Reds and greens for example can look very bright and skin tones can look strange. 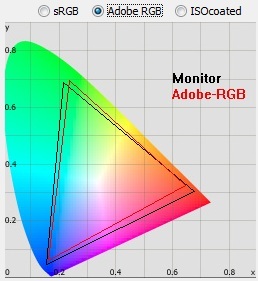 Some users actually like the bright, vivid colours anyway especially in games and movies, but others who are looking for accuracy and who don't want to deal with the complications of a mis-match across their workflow may instead want to use a monitor with a standard sRGB gamut. In the case of the SX2762W you can have the best of both worlds through this emulation mode. We switched to this sRGB mode and tested it at its default settings. You will note that the colour temperature and gamma settings were now labelled as 'standard' in the OSD menu, and we also lost access to the RGB controls. As you can see from the CIE diagram the sRGB emulation offers a very reliable coverage of the sRGB colour space and works very well. The monitors gamut almost exactly matches the sRGB reference in this 2D view which is great. Some of the other areas remain unchanged and the gamma, colour temperature, luminance, black depth and contrast ratio are almost exactly as they were before. The colour accuracy however is improved drastically and this mode offers an excellent factory calibration it seems. dE was 1.1 average with only 2.2 maximum dE. For those wanting to work with the sRGB colour space only, this is a very welcome and well set up preset mode. As you can see there is a deviance between the specified colour temperature and the recorded colour temperature in all of these modes. At the warmer end the deviance is less and at the warmest 4000k setting it is only 410k out. As you increase the setting the reality strays further away from the requested temperature and there is a deviance of 1246k at the coolest 10,000k setting. The 6500k default mode was 691k out from the target sadly, but the 'native' colour temperature mode seemed to actually be closer to our target, and was measured at 6350k. In the first case we carried out a basic software level profiling of the screen. Changes would be made at the hardware level through adjustments to the OSD menu brightness. contrast and RGB controls manually during the process. We changed to the 'native' colour temperature mode to start with as this had returned us a default white point closest to our target of 6500k. This screen is of course designed to be hardware calibration, and we will test that shortly as well. During the calibration process we adjusted the brightness and RGB gain in line with the guidance from the LaCie software. In changing the RGB channels the colour temperature mode reverted to 'user' which confirms you are using a manually adjusted setup for RGB. After this I let the software carry out the LUT adjustments at a graphics card level and create an ICC profile. 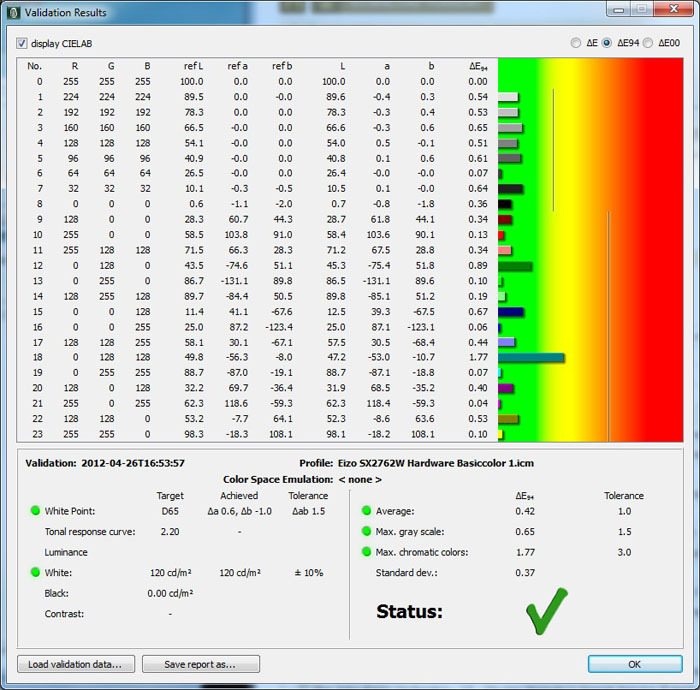 In nearly all areas, the software profiling calibration could be considered a success. Gamma was improved and was now 2.2 on average. White point was within 1% of the target at 6462k, and colour accuracy was improved nicely with dE average of 0.6, and maximum of 2.1. It seemed to have trouble correcting the blue shades properly for some reason despite multiple attempts and different settings. Luminance had been reduced to a more comfortable 120 cd/m2 through the adjustment of the brightness control to 30%, and the calibrated black depth was 0.18 cd/m2. This gave us a mediocre calibrated contrast ratio of 649:1. Ok for an IPS panel but not as good as some modern IPS screens. Testing the screen with a series of colour gradients showed very smooth transitions with no evidence of banding at all, and only some very slight gradation in darker tones. We then switched to the sRGB preset mode to carry out a software profiling of the screen in the smaller colour space. In this mode you do not have access to the RGB channels at all and so we left the gamma mode at its default 'standard' setting and again changed the colour temp mode to 'native' as it was the closest starting point to our 6500k target. We altered the brightness as guided by the software and then let the calibration device and software make the corrections at the graphics card LUT level again. Again the software calibration was largely a success with gamma, white point and luminance targets being met nicely. You will note that the emulation of the smaller sRGB colour space is very reliable which is great news for those wanting to work with a smaller colour space than is natively supported by the backlight unit. Contrast ratio after calibration was a little lower here at 601:1 and there still seemed to be an issued correcting the blue shades completely, leaving us with a dE average of 0.6 and maximum of 1.8. Gradients were again very smooth with no evident banding and only some slight gradation in darker tones. To allow users to get the most out of their screens like this, Eizo provide their own 'EasyPIX' calibration package which is an optional extra with this FlexScan SX2762W screen. 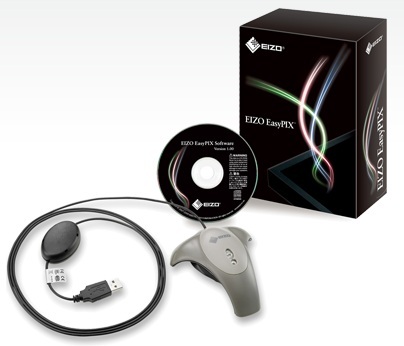 The package consists of an EasyPIX software CD along with an Eizo branded DataColor Spyder3 device which they refer to as the "EX1 Photo Sensor". It allows you to hardware calibrate and tweak your screen and can also be used for colour matching between your prints and monitor. We downloaded the latest version of the software to test it. For Windows this is a pretty big 57.7Mb file (v2.1.2) and for Mac OS it is a whopping 106Mb. Unfortunately though we did not have access to the EX1 Sensor in the package and so the tests are limited here. 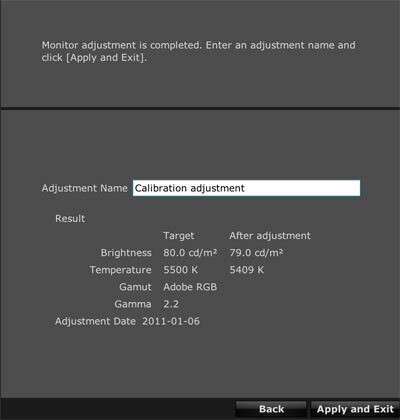 Loading the main software window presents you with a basic adjustment screen as shown above, giving you 3 possible calibration profiles along the left hand side. If this is the first time you've adjusted the screen you have to click "adjust from the beginning" to progress. It should be noted that because we didn't have access to the EX1 Sensor device, clicking "adjust from the beginning" did not allow us to carry out a calibration of the screen ourselves. We tried the software with various devices including an i1 Display 2, i1 Pro and even a normal Spyder3 device. None communicated with the software to allow for a screen calibration, and on checking with Eizo they confirmed that the software is locked to their EX1 Sensor. This is a bit of a shame as it forces you to buy their device if you want their free software solution to calibrating the screen at a hardware level. If you don't have the EX1 Sensor then you will need to find another software package which allows you to calibrate the screen at a hardware level. We will look at this in a moment, but needless to say they would be an additional cost. It would have been nice if Eizo had allowed compatibility of their EasyPIX software with third party devices for those who already own a colorimeter and just want to hardware calibrate their new screen using it. For a quick overview we have provided some screenshots of what would be available from the software if you did use an EX1 Sensor and could carry out the calibration as normal. Once you have entered the process, you can define your targets for luminance, colour temperature, the gamut of the screen and the gamma. Once defined you can start the process and it will automatically adjust these for you at the monitors hardware LUT level. It is interesting to see here that as a gamut mode you are able to define in their software a calibration to the Adobe RGB colour space, which is otherwise not available from the OSD preset modes. This might be useful for those wanting to reduce the native gamut a little to this Adobe RGB space. These are the only settings you can define and you can then progress into the calibration process. Once completed, if necessary, you can fine-tune the brightness and colour manually by selecting "Finely Adjust." We would have liked to have been able to test this software in full but as we've said it is unfortunately locked to the EX1 sensor. As such you can't use this software to hardware calibrate the screen with other devices and so we will find an alternative to get the most out of the screen through adjustments to the monitors LUT. The software itself seems easy enough to use although is quite basic and lacks any real reporting or validation function. As we have already discussed, the SX2762W is capable of being hardware calibrated. The screen allows you to control and adjust the internal 16-bit LUT of the screen for optimum performance, accuracy and control. 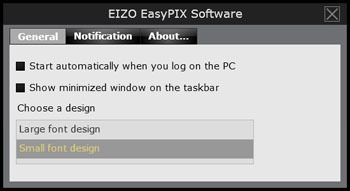 Eizo will only allow you to use their EasyPIX software with the screen if you also purchase and use their re-branded Spyder3 sensor (EX1 Photo Sensor) and so if you want to use another device you will need to find an alternative software package which is capable of making hardware level adjustments. We tried various popular and high end packages to see which would allow communication with the hardware LUT and a full calibration. We had no luck with the LaCie Blue Eye Pro software which only allowed us to make software level calibrations as we have already carried out earlier. Quato's iColor Display (v3.8.3) also did not allow hardware calibration with this screen and seems to only support hardware control for their own range of screens. However, we did find that BasICColor Display (the latest v5.0.3) did allow hardware calibration which was great news. 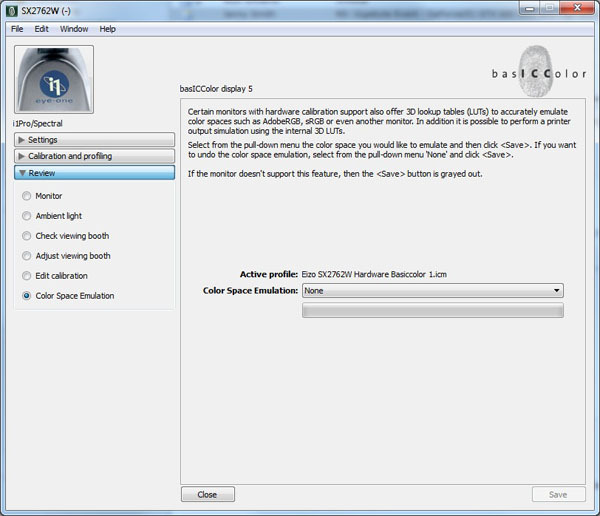 BasICColor even offer a free 14-day trial license which allows you to test the software in full if you need to. It's a very decent package and has a great range of options, along with a very good reporting and validation function. Loading up the software presents you with the screen above, where you can see hardware calibration is available as an option. On a screen without hardware calibration support this would be greyed out normally. You can select your device and then control various aspects of your target settings from the left hand side. You can instead select from a series of preset settings if you would rather from the drop down on the right. We have opted to define our own custom settings in line with our normal review targets. We will give you a quick overview of some of the settings and sections. Above you can control the white point / colour temperature target and then the gamma curve. You can also define the target luminance and black point and set the type of profile which will be created. There's also a handy option to measure the current luminance and black point (and therefore contrast ratio) if you need. Once targets have been defined you press start, align your device on the screen (here we used our i1 Pro Spectrophotometer) and then the process is entirely automated. The software is able to control the monitor at a hardware level and so you need make no adjustments to the brightness, contrast or RGB levels in the OSD menu. You can carry out this hardware calibration when in any of the 3 user modes from the OSD menu and it will make changes to all the OSD controls for you automatically. That preset then becomes your customised hardware calibrated mode which you can switch to and from whenever you like. So you do have the option to set up 3 different presets with different settings for different uses. The process itself takes a good 5 minutes to complete and at the end you are presented with a validation report as shown above. This measured various aspects of the screen after the calibration in a decent amount of detail. You may note here that I have removed the measured black point and resulting contrast ratio from the results. That is because the measurements were made using the i1 Pro which has poor low light accuracy (<0.20 cd/m2). Instead we validated the black depth and contrast ratio separately as shown in the small table beneath using an NEC optimised i1 Display 2 colorimeter. From the hardware calibration you can tell the results were very pleasing. White point had been met very closely within a very small deviance. With a luminance of 120 cd/m2 we had a calibrated black depth of 0.18 cd/m2 and a static contrast ratio of 667:1 which was actually slightly higher than when we had carried out software profiling of the screen. Colour accuracy was also great with a dE average of 0.42. Testing the screen with a series of colour gradients showed very smooth transitions with no evidence of banding at all, and only some very slight gradation in darker tones. Since this hardware calibration we will refer to these results as our optimum achieved performance for the comparisons and in the rest of the review. As a side note, the BasICColor software offers an option for colour space emulation, allowing you in theory to emulate the slightly smaller Adobe RGB colour space, or even the sRGB colour space. On the SX2762W this option was not available and so it seems the BasICColor software cannot be used to control this colour space emulation on this screen. As a result, you have a slightly limited control over the calibration of the screen. By default, the screen offers a series of OSD presets which all operate in the native full wide gamut. There is an sRGB mode which can offer reliable emulation of the smaller sRGB colour space. Thankfully this is also well factory calibrated in many areas. There is no OSD mode for Adobe RGB emulation available however, leaving a gap for those who might want to closely match this colour space. From a calibration point of view you can software calibrate the screen in either the full native gamut or in the sRGB mode. From a hardware calibration point of view the flexibility is a little less. Eizo's EasyPIX software seems to offer colour space emulation for hardware calibration including modes for Adobe RGB and sRGB. Since this software only works with their EX1 Sensor, this is not readily available when using other devices and we were unable to test it to confirm if it worked correctly. As an alternative for hardware calibration we found that the BasICColor software worked well, while other packages did not support hardware level calibration. However, it does not allow you to choose colour space emulation on this screen and so you can only hardware calibrate the screen at full native gamut or in the sRGB mode. It would have been nice to see support for third party devices with the EasyPIX software or support for colour space emulation using BasICColor really. As a result you have very little flexibility if you want to work in the Adobe RGB colour space exactly (as opposed to the wider native gamut) and it seems the only option if you do would be to purchase the Eizo EX1 Sensor package. A shame if you already have another device you've spent money on. For reference I also carried out a hardware calibration of the SX2762W using the BasICColor Display software when in the sRGB preset mode. This mode allowed emulation of the smaller sRGB colour space and the software allowed further corrections to be made in all other areas, As you can see, calibration was again a great success, although the calibrated static contrast ratio was a little lower here at 626:1. I've provided a comparison above of the SX2762W against some of the other screens we have tested. Out of the box average dE was 4.4 which was not particularly good compared with some other screens. Perhaps the most direct competitor here for the Eizo is the NEC PA271W and SpectraView Reference 271 models which were more accurate out of the box in terms of colour accuracy (1.1 and 1.5 dE average respectively). The NEC uses the same LG.Display IPS panel and offers hardware calibration support and a whole host of high end pro-grade features. The default factory set up, at least in the default preset mode was much better on the NEC models. The Dell U2711 is also another popular 27" IPS alternative for a more mainstream user. 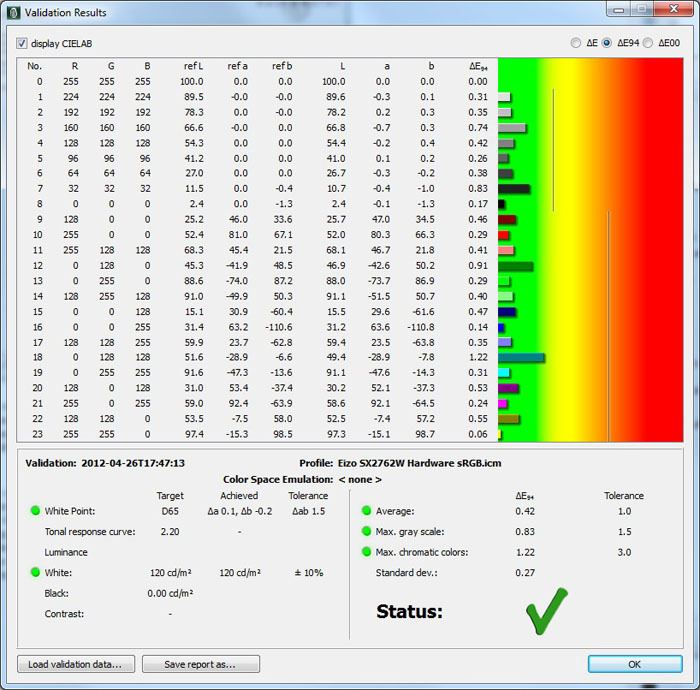 Out of the box colour accuracy was a little better than the Eizo as well at 3.7 dE average. 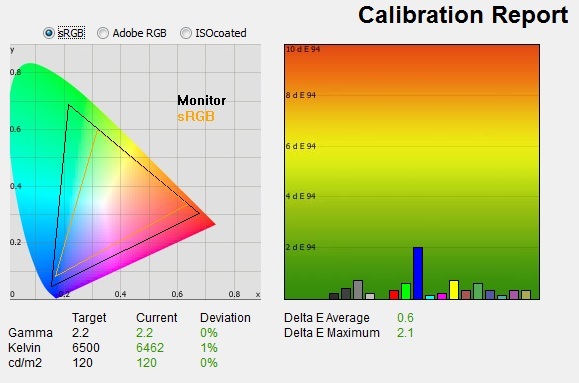 Some form of software profiling using a colorimeter, or preferably hardware level calibration would be useful to correct the colours and also any other discrepancies in the gamma and white point. Given this is a professional grade screen which costs a lot of money it is important to have access to a calibration tool to really get the most out of it. I expect users considering a screen like this would have a device available or at least plan to buy one at the same time. 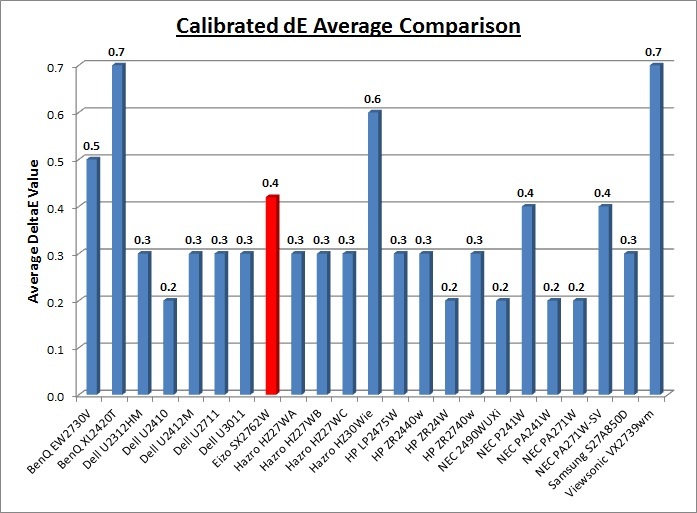 Once calibrated the dE average was reduced to 0.4. This would be classified as excellent colour fidelity by LaCie. It was not quite as low as some of the other screens here which reached down to 0.2 average, but in practice you would not notice any real difference here. Professional grade monitors like this Eizo and also the NEC PA series and P241W offer other high end features which separate them from some of the other models shown above as well, including extended internal processing and hardware calibration. These comparisons are based on a small selection of tests, so it should be remembered that other factors do come into play when you start talking about professional use. As such the NEC and Eizo screens here should really be separated from the others when talking about absolute accuracy and reliability. 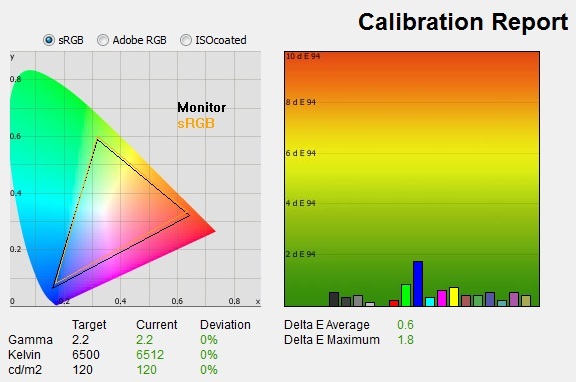 The calibrated contrast ratio of the SX2762W was ok, but not great by modern IPS standards. The contrast ratio was 667:1 after calibration which was comparable to some other screens including the Dell U2711 (672:1) and NEC PA271W (600:1). Some other smaller IPS panels are capable of higher contrast ratios though, such as the Dell U2412M (947:1) and HP ZR2440w (935:1). Other technologies such as PVA and MVA can offer very impressive contrast ratios, ranging up to 1977:1 in this comparison for example on the BenQ EW2730V (AMVA based). On some other screens the static contrast ratio of modern MVA and PVA panels can reach even higher, up to ~3000:1 which IPS cannot compete with at the moment. The luminance range of the screen was very good with a total adjustment range of the backlight of 175.8 cd/m2. At the top end, the maximum brightness setting returned a luminance of 238 cd/m2 which was a little shy of the 270 cd/m2 specified maximum brightness. At the lowest setting the screen reached a nice low 62 cd/m2 and so even those wanting to use the screen in low light conditions should be fine. A setting of around 25 - 30% should return you a luminance of around 120 cd/m2 if needed. Black depth ranged from 0.34 down to 0.10 cd/m2 and reduced as you lowered the brightness setting as you would hope. 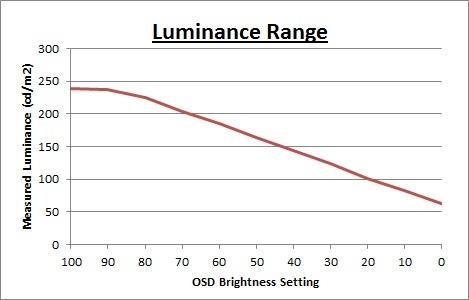 The plot of the luminance on the above graph shows that the adjustment of the backlight is not quite linear overall. At the top end of the range the settings between 100 and 90 didn't seem to alter the backlight at all, but after that the change reduced the overall luminance as it should in a linear fashion. The contrast ratio remained very stable across the range of brightness adjustments which was pleasing, except at the very lowest settings where it was reduced a little between 10 and 0% brightness. The average contrast ratio was 684:1 at default settings which is reasonable, but not great for a modern IPS panel. 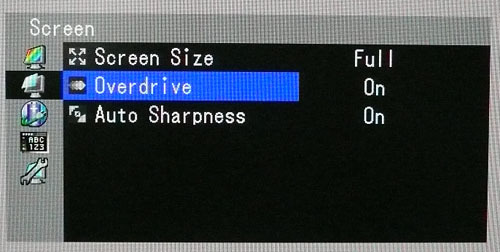 The Eizo SX2762W doesn't feature a dynamic contrast ratio as such but it does offer a "Contrast Enhancer" option from within the advanced settings section of the Color menu as shown above. According to the manual "This feature manages the brightness and gain levels of the backlight to match the image displayed while also improving the sense of contrast of images by correcting gamma values." In practice it didn't seem to do much at all, although when switching between extremes of a 100% black image and then returning to a normal desktop, you could see it take around a second to stabilise the gamma and colour tones a little and return them to normal. It doesn't seem to control the backlight intensity at all and so has no impact on a dynamic contrast ratio, but seems to make some more finite adjustments at the digital white and black levels perhaps and through changes to the gamma. Viewing angles of the SX2762W were very good as you would expect from an IPS based panel. Horizontally there was very little colour or contrast shift at all until wide angles past about 45°. Contrast shifts were slightly more noticeable in the vertical field but overall they were very good. The screen did offer the wide viewing angles of IPS technology and was free from the very restrictive fields of view of TN Film panels, especially in the vertical plane. It was also free of the off-centre contrast shift you see from VA panels. On a black image there is a characteristics IPS white glow, but in normal working conditions this shouldn't present too much of a problem. The above image was taken in a darkened room to demonstrate the white wide angle glow when viewing a black screen. There is no A-TW polarizer on this panel which is rarely used now in the market but was implemented on some older screens to improve the off centre black viewing. If you are viewing dark content from a close position to the screen you can sometimes see this pale glow on parts of the screen towards the sides and corners because of your proximity to the screen and your line of sight. This is accentuated a little due to the size of the 27" panel. The edges of the screen are at an angle from your line of sight which means you pick up this white glow to a smaller degree if working with dark content. This disappears as you move backwards away from the screen where the line of sight does not result in a wide angle view of parts of the screen and you can see the screen largely from head on. It is only really apparent on darker content and only really if you are working in darkened lighting conditions on this model. The Eizo SX2762W offers an advanced feature which is designed to help improve uniformity and stabilize the image being displayed. This is much like NEC's ColorComp but here Eizo refer to it as DUE, or Digital Uniformity Equalizer. 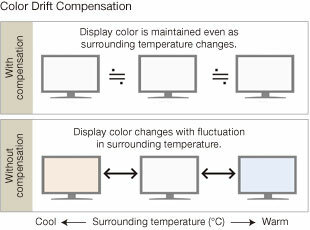 Fluctuations in brightness and chroma on different parts of the screen are characteristic of LCD panels and particularly apparent on larger displays. DUE is designed to help compensate for these errors, resulting in a much more uniform image. In addition to that, to ensure proper display of colour, the FlexScan SX2762W comes equipped with patented Eizo technology that stabilizes the monitor's brightness level after start-up or coming out of power saving mode. Furthermore, a temperature sensor detects and automatically suppresses changes in colour and brightness caused by fluctuations in the surrounding temperature. Both these features including the DUE are enabled by default and cannot be turned off or down at all. As such, the features are always enabled on the SX2762W. Measurements of the screens luminance were taken at 35 points across the panel on a pure white background. The measurements were taken using BasICColor's calibration software package, combined with the NEC customised X-rite i1 Display 2 colorimeter. 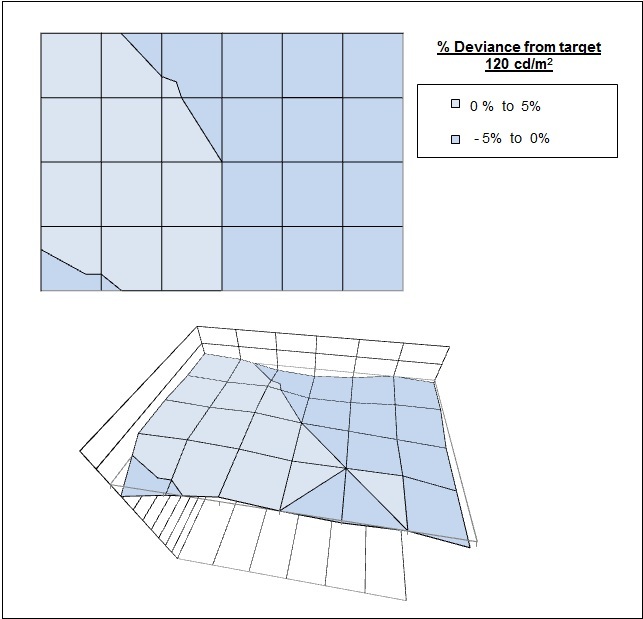 The above uniformity diagram shows the difference, as a percentage, between the luminance recorded at each point on the screen, as compared with the reference point in the centre of the screen of 120 cd/m2. The below shows the variance in the luminance across the screen compared with this point as a percentage. It is worth noting that panel uniformity can vary from one screen to another, and can depend on manufacturing lines, screen transport and other local factors. This is only a guide of the uniformity of the sample screen we have for review. The luminance uniformity of the Eizo SX2762W was excellent as you can see from the above. The luminance deviated by only -4.35% at the lowest level (down to 115 cd/m2 in the bottom left hand corner) and up by only +2.44% in portions of the left hand half (up to 123 cd/m2 maximum). The DUE technology is obviously doing a wonderful job of controlling and stabilising the luminance of the panel and as a result you have a very uniform brightness indeed. 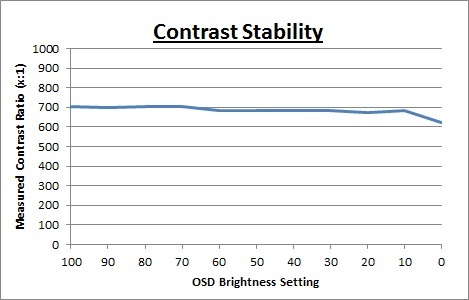 The only possible disadvantage to DUE and other uniformity correction technologies is that they can sometimes have an impact on contrast ratio. Given the fairly mediocre contrast ratio we recorded for this screen (~677:1 once calibrated) it might have been nice if the user was able to control the level and intensity of the DUE like on NEC's ColorComp control. This might have helped return a higher contrast ratio we expect which some might prefer. Nevertheless, for the purposes of this particular test it performed excellently. As usual we also tested the screen with an all black image and in a darkened room. A camera was used to capture the result. The overall appearance of the screen in this test was good really, with only some slight pale clouding towards the top and bottom right hand corners of the screen, which you can pick out in the photo. There was no severe backlight bleed along any of the edges thankfully. The Eizo SX2762W features a massive 2560 x 1440 WQHD resolution which is only just a little bit less vertically than a 30" screen. The pixel pitch of 0.233mm is very small as a result, and by comparison a standard 16:10 format 24" model has a pixel pitch of 0.270mm and a 30" model has 0.250mm. These ultra-high resolution 27" models offer the tightest pixel pitch and therefore the smallest text as well. I found it quite a change coming from 21.5 - 24" sized screens, even those offering quite high resolutions and small pixel pitches. Some users may find the small text a little too small to read comfortably, and I'd advise caution if you are coming from a 19" or 22" screen for instance where the pixel pitch and text are much larger. I found a 30" screen to be quite a change with text size when I first used one, and this is very similar and even a little bit smaller! I still personally prefer the slightly larger text of a 24" model myself, but I expect I could happily get used to the added resolution on these models given time. The extra screen size also takes some getting used to over a few days as there really is a lot of room to work with. The massive resolution is really good for office and general use, giving you a really big screen area to work with and it's excellent for split screen side by side working. It is a noticeable upgrade from a 24" 1920 x 1200 resolution, and it's good to see Eizo have opted for a high res panel here rather than reverting to a 1920 x 1200 / 1920 x 1080 res panel as you may find in other older 27" models. For those wanting a high resolution for CAD, design, photo work etc, this is a really good option. The image was very sharp and crisp and text was very clear over the digital DVI and DisplayPort interfaces. There is no analogue input offered here to compare with because of the high native resolution of the panel. There were a couple of preset modes you may want to try and use for office work. The 'paper' mode is very bright with a 100% brightness setting by default. The colour temperature in the OSD menu is also set at 4500k which makes the image look very yellow. Then there is the 'text' preset mode. This is set at 10% brightness and with a 5000k colour temperature. As a result it's quite a bit darker than our calibrated user mode (at 120 cd/m2) and a little warmer. These might be useful for some people, although I didn't feel they were ideal preset modes. The paper mode is too yellow in colour and the text mode is very dark. The screen offers a 2 port USB hub which is useful for connecting external devices. The ports are located on the back of the screen so they aren't the easiest to reach for quick connecting and disconnecting of devices. Fine for leaving things connected and tucked nicely out of the way, but I would have liked to have seen a couple of ports on the side of the bezel for easier access. There was a very good range of ergonomic adjustments available from the screen and all were pretty smooth to operate. The height adjustment was perhaps a little cumbersome given the size and weight of the screen itself. The screen even offers a rotation function, although this is probably impractical at this size. Some of the energy saving features are also great to see included, and should be useful in an office environment as well where multiple screens are set up. The ambient light sensor can be handy for altering the backlight intensity with changing lighting conditions, and the human motion sensor is a nice extra feature. The only other thing left off which I would have perhaps liked to have seen, but which is rarely offered, is a card reader of some sort. The screen is designed to run at its native resolution of 2560 x 1440 and at a 60Hz recommended refresh rate. However, if you want you are able to run the screen outside of this resolution. We tested the screen at a lower 1920 x 1080 resolution while maintaining the same aspect ratio (16:9) to see how the screen handles the interpolation of the resolution. At native resolution the text was very sharp as you can see from the top photograph. When you switch to a lower resolution the text is a little more blurry although to be honest the image still looked pretty good to the naked eye. There was some slight overlap of the text across pixels leading to the slight blur, but it was not as bad as we'd seen on some other screens. Of course native resolution is recommended wherever possible. The SX2762W is rated by Eizo as having a 6ms G2G response time which implies the use of overdrive / response time compensation (RTC) technology, used to boost pixel transitions across grey to grey changes. The LG.Display LM270WQ2-SLA1 IPS panel being used is rated by LG.Display with a 12ms ISO response time (black > white > black) as well to give you the full information. Before we get in to the side by side screen comparisons I want to quickly talk about the 'overdrive' control available through the screens OSD menu. It is available within the 'screen' section as shown above. This allows you to manually control the activation of overdrive / RTC impulse on the screen, with settings of on and off available. Overdrive is designed to help improve pixel responsiveness and reduce motion blur and ghosting in practice by speeding up the transitions the pixels make to change from one colour to another. You may wish to read our specs section for some further information about overdrive / response time compensation. The screen was tested using the chase test in PixPerAn, a good bit of software for trying to quantify differences in real terms responsiveness between monitors. As a reminder, a series of pictures are taken on the highest shutter speed and compared. The images above are the best case examples from the screen with the 'overdrive' setting turned on and off. When the overdrive control is set to off there is a more pronounced blur to the moving image. There are no severe trail images and no obvious ghosting but the moving image is not as sharp. 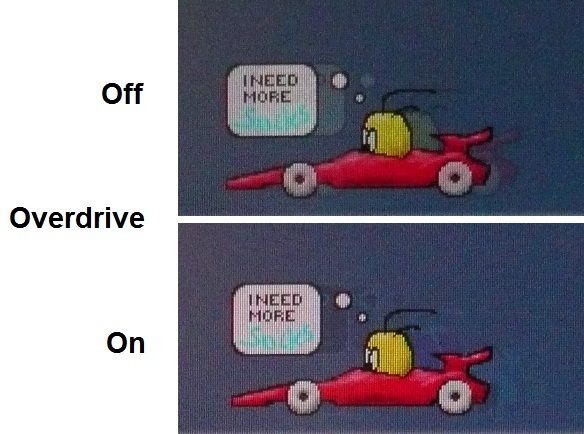 When you switch overdrive on you can spot an improvement to the movement of the car, with a reduction in blurring being noticeable even to the naked eye. However, as a result of the overdrive control being applied aggressively, and due to the poor control of how it is applied, there are some artefacts and side effects produced. You can see a dark trail behind the moving image now which is unfortunate and although it is not too severe you can notice it in practice. There is a slight pale halo as well noticeable across some colour transitions. The overdrive control does offer some improvements in terms of pixel responsiveness in practice and for gaming I expect most people would prefer to enable this feature. If the dark trails become too distracting you may wish to switch overdrive off. The SX2762W was not the fastest screen in these comparisons but did perform quite well nonetheless. Remember that this screen is not aimed at gamers at all as it is a professional grade monitor and is expensive as a result. Some users may well want to run the occasional game as well so while it's useful to test its performance in this area, it needs to be taken in context. With the overdrive feature enabled the SX2762W performed quite similarly to the NEC PA271W / SpectraView Reference 271 screen which is its closest rival of the screens shown here. There was also some slight dark trailing on the PA271W when the 'response improve' feature (same as overdrive on the Eizo) was enabled. The Dell U2711 is another obvious contender with a similar panel being used and some similar features on offer. The Dell is however lacking some of the professional grade features of the Eizo and NEC displays here though and so is a more mainstream, and lower cost alternative. The Dell again showed some low levels of motion blur thanks to the use of overdrive on that model. However, the dark overshoot was more noticeable on the U2711 to the point of being quite distracting in practice. The Samsung S27A850D uses a PLS panel from Samsung which is designed to rival LG.Display's popular IPS technology. That model was very impressive in these tests, showing very low levels of blur and no obvious overshoot in the 'faster' response time setting. More aggressive settings of that response time control did result in overshoot however. Lastly the HP ZR2740W is again another IPS panel, but this time one paired with W-LED backlighting. It is rated with a 12ms G2G response time and although it performed pretty well it was a little behind the others shown here in terms of motion blur. I have provided a comparison of the SX2762W against some other models which are also 27" in size. The responsiveness of the IPS based Hazro HZ27WC was overall slightly ahead of the SX2762W with an ever so slightly more pronounced blur to the moving image, but freedom from the dark overshoot and trails. The Hazro HZ27WB was a bit slower than the HZ27WC and the SX2762W with a more noticeable motion blur, despite its low 6ms G2G spec on paper. The AMVA based 27" BenQ EW2730V is also included this for comparison to demonstrate that unfortunately the responsiveness of some modern AMVA panels is somewhat behind current IPS panels. There is a much more obvious blur and ghost image on that model, even though its rated with an 8ms G2G response time. This goes to show you can't always rely on specs to give you a true idea of how a panel will perform in real life. Above is a comparison of the SX2762W against some popular models in smaller sizes. Again these other 3 models are IPS based. The HP ZR2440w had performed very well in these tests and showed a slightly lower level of motion blur to the SX2762W in practice. There was a very slight dark and pale halo trail evident in those tests but it was very slight and not quite as noticeable as on the Eizo. The Dell U2412M and U2312HM again offered low levels of motion blur but a more obvious dark overshoot trail was introduced again. The SX2762W seems to be quite comparable to the Dell U2412M and U2312HM in practice in these tests which is pleasing considering it is not a gamer-orientated screen. I've also included a comparison above against 3 gamer-orientated screens, including the 27" TN Film based ViewSonic VX2739wm. While it is the same size as the SX2762W, it is very different of course. That model is aimed primarily at gamers and even has a 1ms G2G quoted response time. It also uses a TN Film panel and offers a much smaller resolution of 1920 x 1080. It performs a better than the SX2762W in these tests and some of the remaining motion blur is eliminated, as is the dark overshoot. This is as expected considering it is a gamer-orientated TN Film model. The other two models here both featuring heavily overdriven TN Film panels, and are combined with 120Hz technology. The pixel responsiveness of both of these is ahead of the SX2762W as well, but more importantly the 120Hz frequency allows for improved 120fps frame rates and the support of 3D stereoscopic content as well. The recently tested BenQ XL2420T offers some very fast performance and is a screen purely aimed at gamers. The Samsung 2233RZ arguably remains our champion purely on the responsiveness tests. Both these screens perform faster in practice though thanks to their 120Hz support, giving you smoother moving images and higher frame rates. The responsiveness of the SX2762W was actually very good really considering this is a large IPS panel and was not really aimed at gaming at all. When the overdrive control was turned on, the screen showed low levels of motion blur and was free from any obvious ghosting. There was a slight dark overshoot introduced unfortunately due to the poor control of the RTC impulse. It was comparable to the performance of some popular IPS models like the Dell U2412M for instance which is actually a pretty decent result. Keep in mind that you will need a pretty powerful graphics card to cope with the demands of such a high 2560 x 1600 resolution as well. 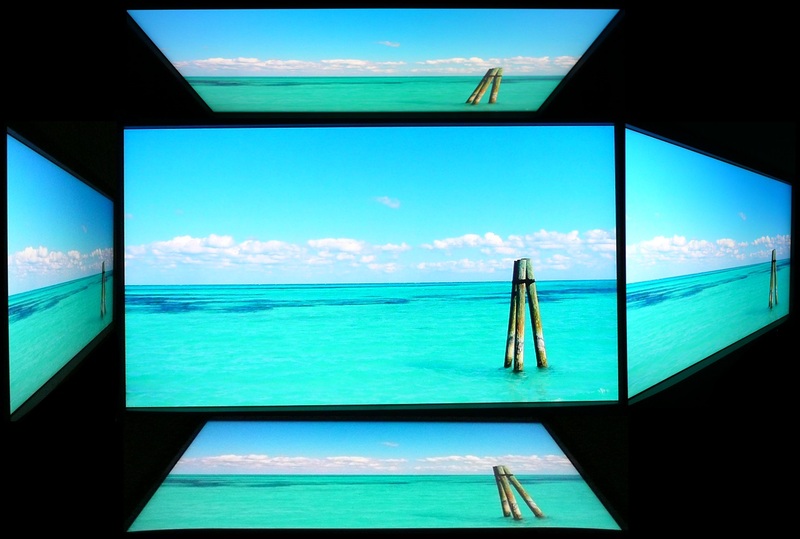 Aspect Ratio Control - The screen offers three settings for aspect ratio control as shown and described above. The 'normal' setting even offers a 1:1 pixel mapping which is pleasing. There are then options to fill the screen and stretch the image if necessary, or to maintain the aspect ratio and enlarge it as much as possible. Preset Modes - While there are a selection of 8 preset modes available from this screen, none are specifically aimed at gaming. You will probably want to set up one of the three 'user' modes to your taste, perhaps boosting the brightness and colour saturation beyond your normal every day set-up. 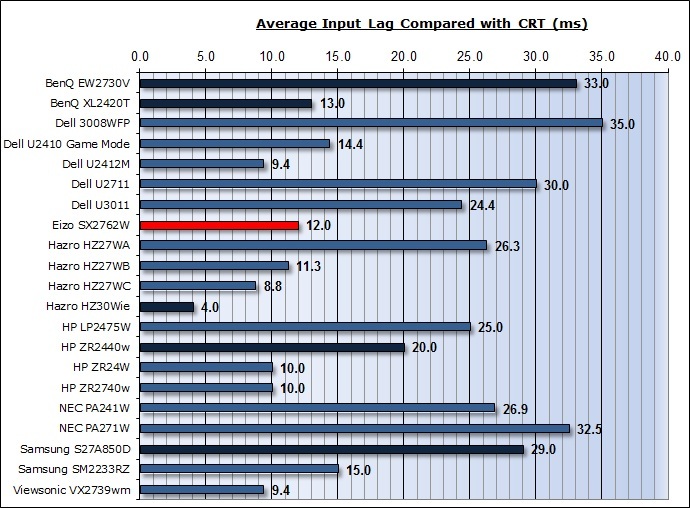 The Eizo SX2762W showed a very low lag of only 12ms on average. This was very impressive considering the high levels of internal processing and electronics and was a pleasing result for those perhaps wanting to game a little on the screen. With a lag of 12ms average the screen should be fine for even some fast paced gaming, and has therefore been categorised as CLASS 1. Good to see DisplayPort and Mini DisplayPort provided for connection of additional devices. 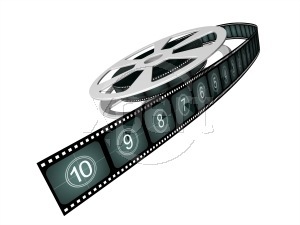 HDMI is missing however which is very popular for external DVD and Blu-ray players. Good ergonomic adjustment range offered by the screen with a good range of tilt and height being very useful. No obvious backlight leakage from the edges which is good. This type of leakage may prove an issue when watching movies where black borders are present but it is not a problem here. For PAL sources, we have tested the screen and it will support the full native resolution of 2560 x 1440 at 50Hz refresh rate. The Eizo SX2762W was a very interesting screen to test and it was good to see what Eizo had to offer in the professional screen market. We were impressed by the wealth of features and options available from the screen, including the all-important hardware level calibration of course. Eizo have done a good job offering a top end spec to hopefully satisfy colour enthusiasts and those working in photography. The 10-bit panel (8-bit + AFRC technically) support may have limited use given current support of 10-bit end to end workflows, but it is there nonetheless for those who can take advantage of it. The wide gamut CCFL backlighting allows you to work with colour spaces outside of the more standard sRGB space, while the screens sRGB preset mode offers a very reliable emulation of the smaller colour space if needed. The programmable 16-bit LUT means you can achieve and control a very accurate setup of the screen at a hardware level which is important for professional users. From a colour point of view the default set-up was not great, but need not be an issue as you will almost certainly want to have access to a calibration device for a screen like this anyway. 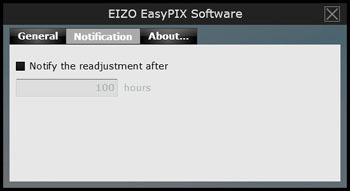 Hardware calibration was unfortunately a little inflexible, with Eizo's EasyPIX software being locked to only work with their device. For those wanting to use other devices, options were available but will require additional costly software to really take advantage of the hardware level calibration. Emulation of the Adobe RGB colour space was also seemingly limited to users of the EasyPIX package, and it was a bit of a shame not to see a preset emulation mode provided to be honest. In other areas, the digital uniformity correction (DUE) technology did an excellent job of stabilising the screens luminance uniformity and this impressed us. It was a bit of a shame that the user cannot control the level of the DUE, or even turn it off, since this may be impacting on the resulting rather mediocre static contrast ratio. Pixel responsiveness and input lag were actually very good which was pleasing considering the screen is not really aimed at gamers. Those wanting to use the screen for gaming can still do so without much issue which is good news. Ergonomically the screen was also very good and some of the extra features like the ambient light sensor and human sensor were nice additions. The SX2762W retails in the UK at the time of writing for ~£955 GBP (inc VAT) which is very comparable to the NEC PA271W at ~£936. This is of course considerably more money than mainstream models like the Dell U2711 for instance (~£540) but there are a lot of extra high-end features provided with the Eizo / NEC models which are not offered on the Dell. The Eizo SX2762W offered some very good all round performance and an excellent set of features and functions and so for those wanting a pro-grade screen at 27" it would be certainly worth a good look.